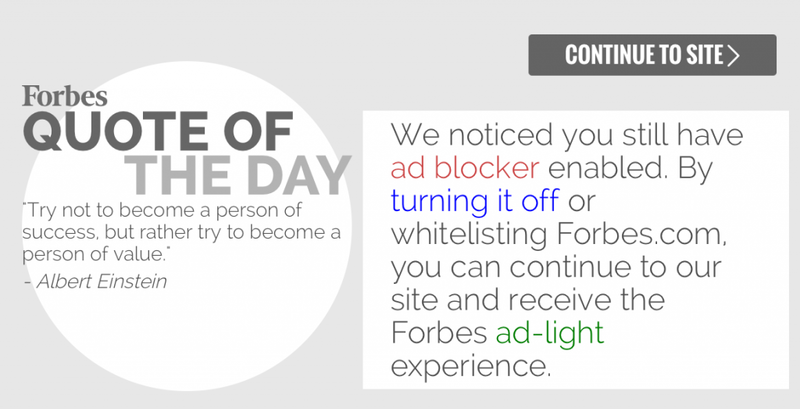 An invitation to settle #adblock matters with @Forbes, @Wired and other publishers. 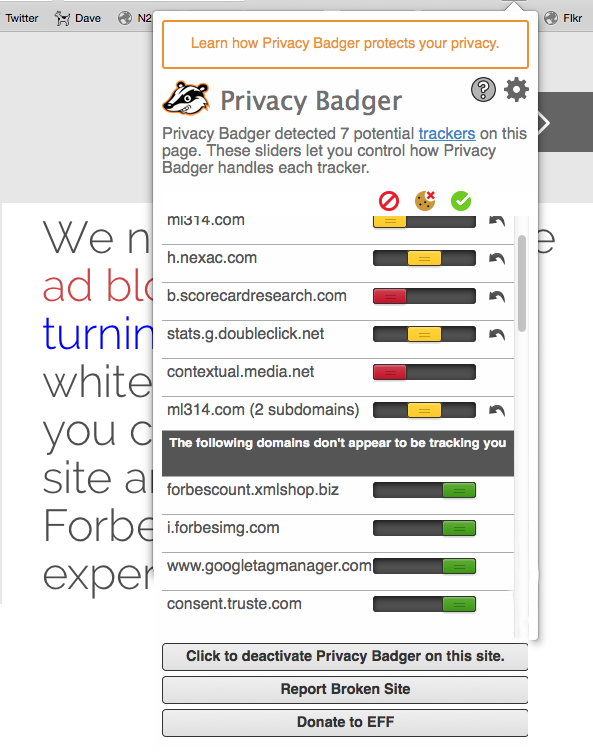 So I’m guessing what blocked the ad was one of the two red sliders in Privacy Badger. I slid the b.scorecardresearch.com one to yellow and it seemed to load the desired page without a problem, but I don’t know if Forbes would have let me though anyway or not . There is no way to tell what did what. Again, I’m not blocking ads. I’m just trying to block tracking. 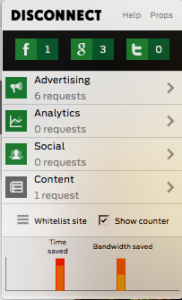 I also just checked, and Disconnect, Ghostery and Privacy Badger are each doing nothing, far as I can tell, to block anything on Wired. They’re all green-lighting everything. That means they’ve already whitelisted it. 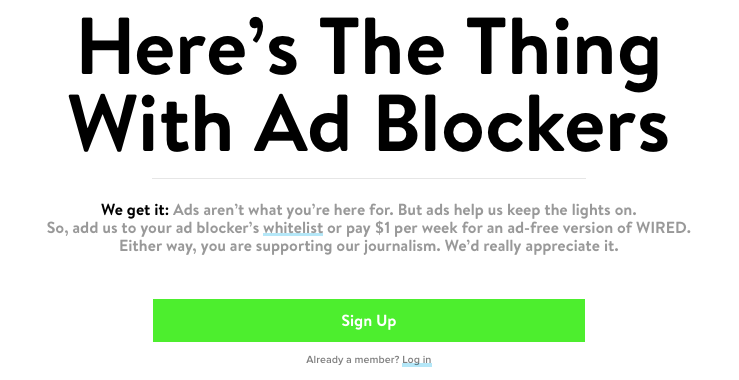 Yet Wired thinks I’m blocking ads. As it happens I‘ve been a Wired subscriber for the duration. But, when I log in (by clicking on the link above), it takes me to a billing page. There it wants to charge me $3.99 every four weeks, which comes to about $52 a year, on top of what I’m already paying for the print publication, which (I would hope) ought to give me access to the same thing online. Very confusing. Thing is, I don’t mind ads. I even like some of them. Back in the millennium, I was a partner in Hodskins Simone & Searls, then one of Silicon Valley’s top advertising agencies. And, like most readers, I want publishers to make money. But I also believe publishers don’t need to do that by tracking me in ways I neither like nor approve. They can give me ads on their pages that are perfectly safe, just like the ads that have funded print magazines for the duration. Those were always respectful of people’s privacy, and don’t rely on a herd of third parties following people around while they go about their lives. They were also more valuable, because they sent clear creative and economic signals, both uncompromised by suspicions of surveillance and other forms of bad acting. There are legitimate reasons that people use ad blockers, according to McClusky, like a desire to speed up web browsing or not wanting to be tracked online. But Wired has bills to pay. “I think people are ready to have that conversation in a straightforward way,” he said. The reason this is a “war,” and it’s impossible for publishers on their own to make peace, is that the only solutions that can scale are the individual reader’s. Ad blockers and tracking protection in browsers all work for the individual, giving everybody scale. Roadblocks and tollbooths like Forbes’ and Wired’s piss readers off, drive them away, or both. Worse, every one of them is different, which is kind of an anti-scale way of doing things. So we need to take another step, again from the individual’s side, this time with an olive branch. And that’s what we’ll do at VRM Day (25 April) and IIW(26–28 April), both at the Computer History Museum in Silicon Valley. I invite Forbes, Wired, and all publishers, advertisers, agencies, browser makers and other parties interested in peace to come join us there. On the table is an easy solution: simple publisher-friendly preference a reader can assert and a publisher can agree to. 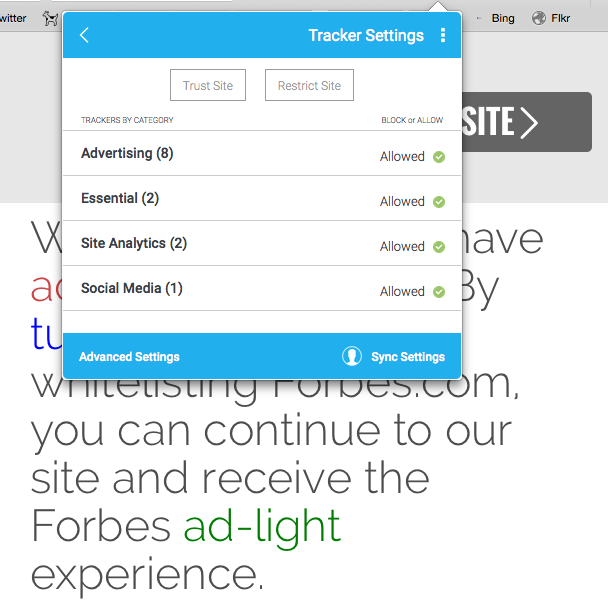 It says, “Just show me ads not based on tracking me” (or words to that effect, which we’ll work out). This term will be standard and enabled by code on both the client and server side. These will live at Customer Commons, which is built for that purpose on the Creative Commons model. Some of the code already exists. We’ll start writing the rest at IIW next week. Both VRM Day and IIW are unconferences. No keynotes, no panels, no sponsor exhibits. Everything happens at breakouts, all of which are topics chosen and led by participants. VRM Day is for presenting and planning the work we’ll be doing over the next three days at IIW. We do two IIWs per year, and this is our 22nd. I don’t know any gathering that is more leveraged for getting stuff done. Register here. For more background on the peace we can forge together, see here and here. The first version of this post was published at blogs.harvard.edu on April 15, 2016. The current version was imported here on April 17.